While operating at a multi-alarm mutual-aid structure fire, Rescue 56 was dispatched to a single car MVC with entrapment. R56 responded from the fire scene in South Bound Brook. Thankfully, the vehicle operator was able to exit the vehicle with minor injuries prior to R56 arriving on the scene. R56 picked up from the MVC and returned to work at the structure fire. Engine 562 responded to a multi-alarm commercial building fire in South Bound Brook boro. Command also requested R56 on an additional RIC assignment. Engine 562’s crew in the aggressive interior firefighting efforts. R56 mixed crews with R25 as the primary RIC company. Station 56 was dispatched to cover multiple brush fires as a result of the massive warehouse fires in Hillsborough Township. While responding E562 was detailed to cover a roof fire from falling embers at a restaurant near the fire site. After the roof fire was extinguished, E562 was redeployed to the tanker shuttle operation. Later in the evening, E562 was then deployed as a supply engine at a draft site supplying L29 (Far Hills-Bedminster). E562 remained on scene till relief arrived at 02:00 hours. A single vehicle plunged into the Delaware and Raritan Canal. The occupant was able to exit the vehicle without injury. 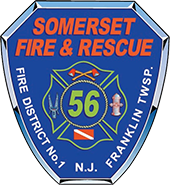 Divers from Somerset Fire & Rescue Co. No. 1 and the Somerset County Prosecutor’s Dive unit retrieved the vehicle without incident. Fire companies from Fire District No. 1 and the East Franklin Fire Company assisted in the recovery. The Franklin Township Police Traffic unit is investigating.